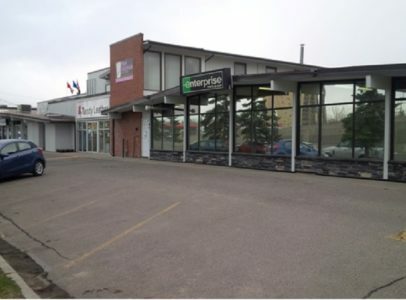 Excellent rental value for office/meeting space on the east side of Macleod Trail, just north of Heritage Drive, opposite the Kingsland Farmers Market. The Landlord is offering flexible terms incl month/month. This walk-up 2nd floor space occupies the entire 2nd floor of bldg. This space is fully developed and incl two washrooms. Although the space would benefit from some renovation, it is definitely serviceable “AS IS” and is priced accordingly!!! There are numerous offices of various sizes (see space plan) incl a good sized meeting room and a reception area. There is plenty of on-site parking + additional street parking on adjacent service road running parallel to Macleod Trail. This is a great opportunity that should be of serious interest to any business or NON-PROFIT groups that are rent sensitive and looking for functional/serviceable space in a great central location. Retail businesses on ground floor incl. Enterprise Rent-A-Car/the Flag Shop/Tandy Leather and Ninja Auto Sales.